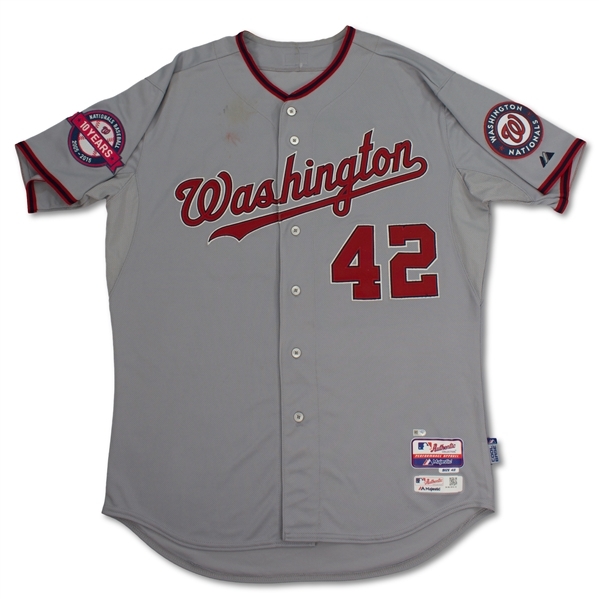 This jersey, which is a gray button down road model, has “Washington” sewn across the chest in red, navy blue, and white tackle twill. 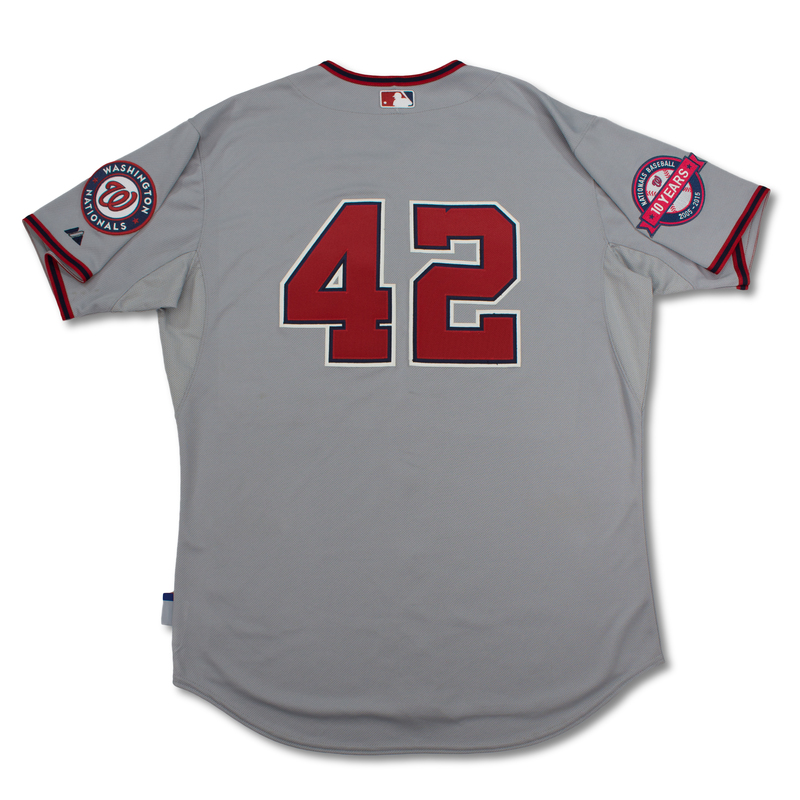 Since this game was played on Jackie Robinson Day, Harper’s customary number “34” has been replaced by the ubiquitous “42” that Robinson wore for the Dodgers. It has been sewn on the chest and back of the jersey in red, navy blue, and white tackle twill. 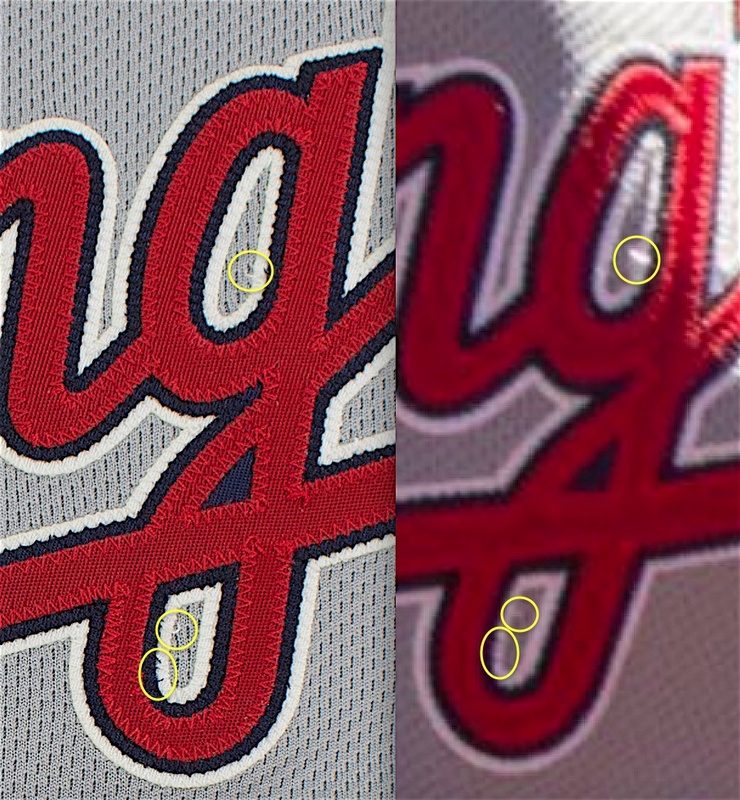 A Nationals 10 year anniversary patch is sewn on the right sleeve, while a circular Nats logo patch is sewn on the left above a navy blue Majestic logo. Red and navy blue bands ring the sleeve and collar openings of this Majestic Cool Base jersey. 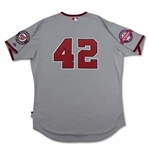 The underarm and sides of this jersey are made of a fine gray mesh. 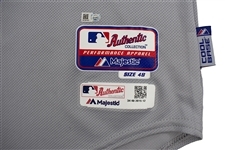 A Majestic size “48” tag has been applied to the front left tail of the jersey. 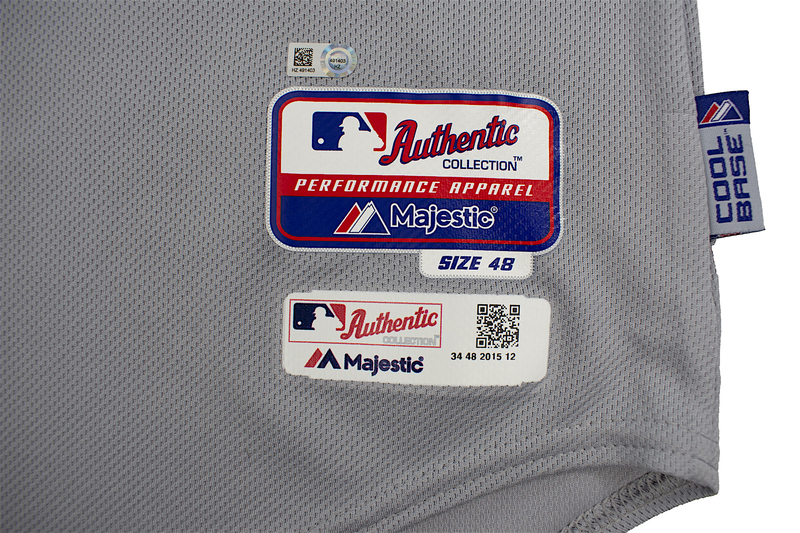 A MLB logo has been applied on the back outside collar. 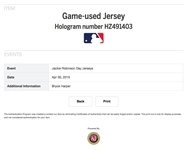 There are some stains, resulting from game use, on the upper right breast of the jersey. 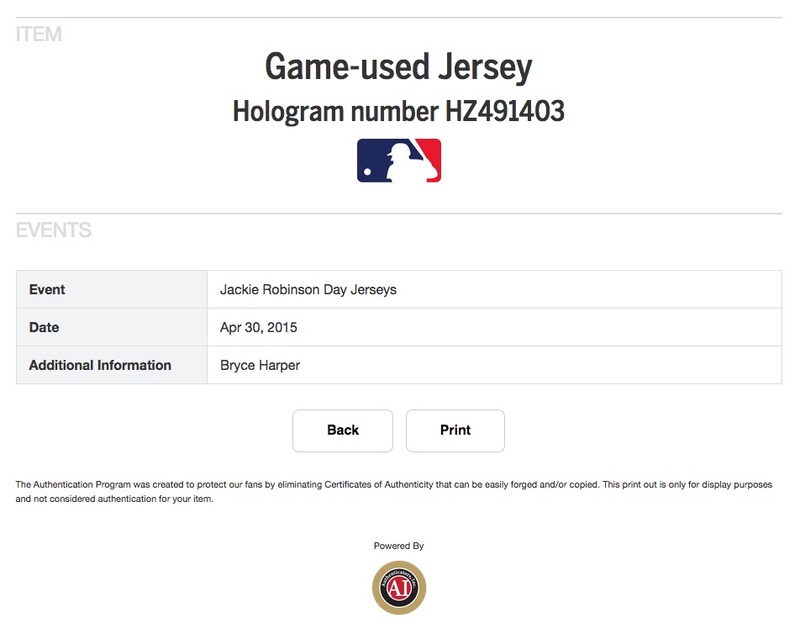 This item comes with a MLB Authenticated hologram (HZ 491403), which dates this jersey to use by Harper during a April 30th contest, however, the jersey was worn on April 15th as that was actually Jackie Robinson day. 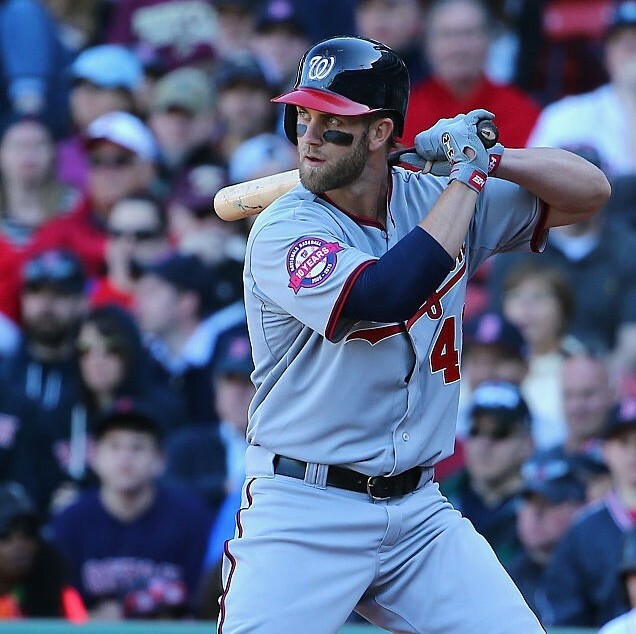 This game, an 10-5 victory over the Boston Red Sox, was a microcosm for Harper’s breakout year. The bearded right fielder finished with his first double of his MVP season along with a single, an RBI and a walk.